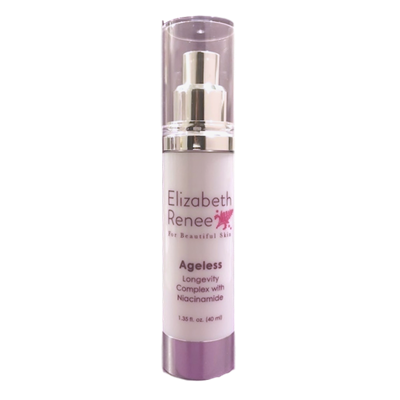 An innovative anti-aging serum which addresses premature aging due to exposure to HEV, (High Energy Visible Light) from computers, smart phones, tablets and smart TVs; AGEs (Advanced Glycation End Products) or wrinkling and loss of tone due to a diet high in sugar; stress induced low energy which lessens the skin's ability to repair itself; and pigmentation changes from toxins in the environment. Today's volatile environment offers new challenges to the health and longevity of your skin. This ultra-luxurious serum takes devitalized, age-ravaged skin and cleverly reverses its destiny using a synergistic blend of age-defying technologies. Time-reversal ingredients target the most intricate and devastating causes of premature aging, giving skin both immediate and long-term results. Synchronized Peptides & Tetrapeptides - establish elasticity, firmness and the skin’s natural lifting process by fortifying collagen and elastin as well as redensifying the extracellular matrix to strengthen, volumizes and defines facial contours. rebuilding ceramides and many other proteins and lipids, for an improved barrier and energized skin tone as well as increased radiance. Liposhield (phyto-melanin) - helps shield skin from exposure to the ‘aging’ light emitted by smartphones, tablets, computer screens and other sources of High Energy Visible Light. Red Algae (anti-glaciation technology) - provides protection against glycation; (AGEs) that cause slack skin and wrinkles due to sugar molecules attaching themselves to the collagen fibers and triggering inflammation. Swiss Garden Cress - This liposomal form of Swiss Garden Cress offers protection against pollutants. Rich in phytonutrients it activates the cells own detoxification and antioxidant enzymes. In the morning apply 1-3 pumps over clean skin depending on your age and skin condition. For highly environmentally exposed skin apply after 1-2 pumps C & E Antioxidant Serum or Sunrise Solution. Always follow with a sunscreen with an SPF of 30 or more.